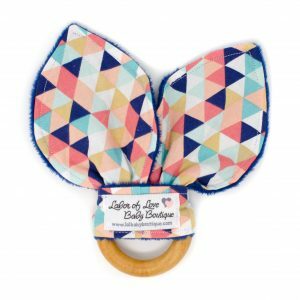 Your baby will love snuggling up to this soft and fluffy rattle block. 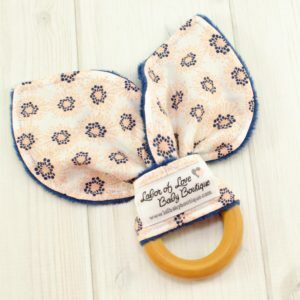 This rattle block measures approximately 4.5 inches by 4.5 inches and is small enough to tuck into a car seat or stroller but still large enough for baby to grasp and hold. 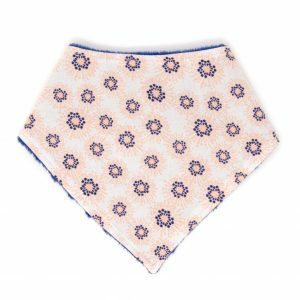 The soft fabrics and gentle rattle will engage your baby’s senses while they explore the toy. 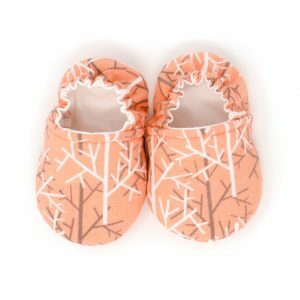 This soft block is made with all three of our Happy Trails Collection cotton print fabric (trees, triangles, and peach flowers) and navy blue polyester velour. There is a blue satin ribbon loop to attach to a plastic toy link to join with other toys or attach to the car seat or stroller (the ribbon has been triple stitched to withstand lots of use and love). The block is stuffed with polyester fiberfill and a rattle.